VALLETTA, MALTA: Queen Elizabeth II on Saturday wrapped up a nostalgic visit to Malta, her one-time home, where she joked that Canada's youthful new leader had made her feel old. The British monarch has close ties to the Mediterranean island, where she lived between 1949 and 1951 while her husband, Prince Philip, was in the Royal Navy. On Saturday she crossed the Grand Harbor in the capital, Valletta, in a traditional Maltese wooden boat. She alighted at the spot where her father, King George VI, landed in June 1943 to present Malta with the George Cross in honor of citizens' bravery in withstanding a World War II siege by the forces of Italy and Nazi Germany. It's the only time a country, rather than an individual, has received Britain's highest civilian award for valor. Later the queen and Philip watched a buggy race at Marsa racecourse before boarding a plane back to London. The horse-loving queen had been due to watch a polo match, but it was canceled due to a waterlogged pitch. On Friday the monarch opened a summit of the 53-nation Commonwealth of Britain and many of its former colonies. She was toasted at a banquet by Canadian Prime Minister Justin Trudeau, whose father Pierre governed Canada for more than a decade from 1968. Trudeau recalled the monarch's many visits to his country, saying she had "seen more of Canada than most Canadians." 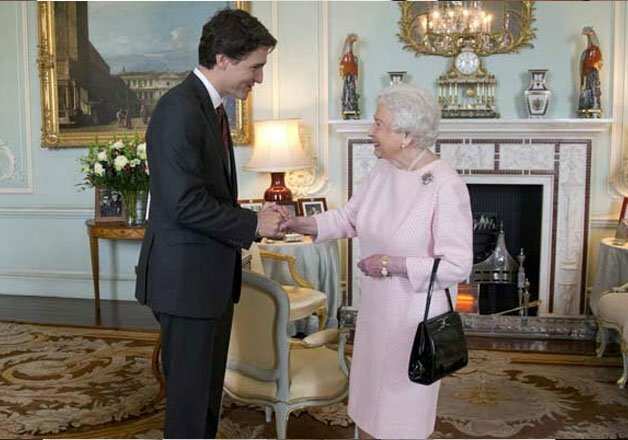 The queen thanked 43-year-old Trudeau "for making me feel so old." At 89, the queen has given up long-haul travel so is unlikely to attend the next biennial Commonwealth gathering, which is held in a different nation each time. Her stature and enthusiasm have helped unite a diverse, diffuse organization whose member nations are home to more than 2 million people on five continents. The Commonwealth espouses good governance, economic growth and human rights but has often struggled to define its role in the world. This year's summit, which ends Sunday, has included talks on combating climate change, violent extremism and corruption. British Prime Minister David Cameron said the Commonwealth "can be a force for good around the world" and urged his fellow leaders to eliminate the "cancer" of corruption. "Corruption wrecks economies," Cameron told reporters. "It corrodes our societies. It can even foment terrorism." Commonwealth leaders also selected British politician Patricia Scotland as the organization's next secretary-general. Scotland, who was born in the Caribbean nation of Dominica, was attorney general under British Prime Minister Gordon Brown and is now a member of the House of Lords.